We would like to share two important tips for taking radiographs in your practice. These tips include the benefit of three-view and left lateral thoracic and abdominal radiographs. 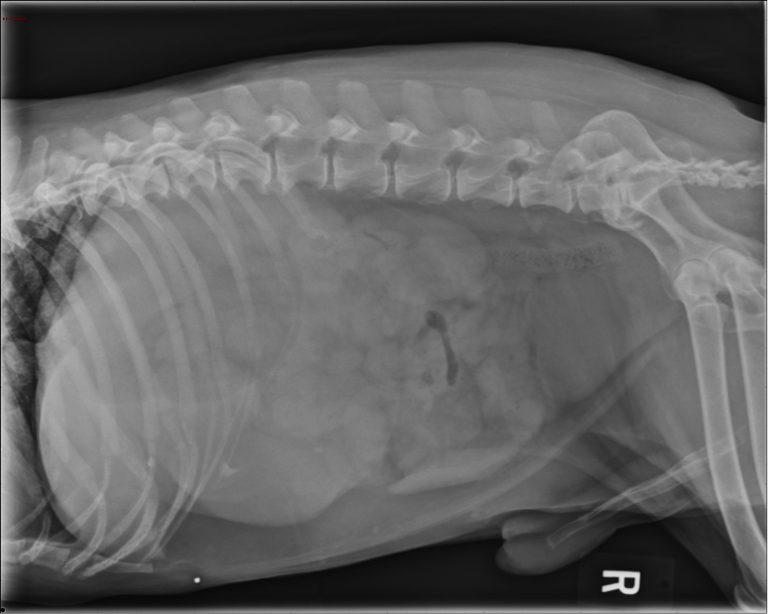 Obtaining two-view radiographs in dogs and cats has long been common practice, most frequently acquiring right lateral and ventrodorsal (VD) projections. The more contemporary standard of care is three-view thoracic and abdominal radiographic studies because of the ability to more accurately rule in radiographic diagnoses and reduce over interpretation of artifacts. Both the thorax and abdomen are susceptible to artifact (especially lungs and gastrointestinal tract). Often the third view can aid in confirming presence of disease as well as artifact. Additionally, three-view thoracic radiographs have been proven in the literature to be more accurate in identifying metastatic pulmonary nodules. This is not to say a three-view radiograph is always necessary. However, as the following four patient stories will demonstrate, there are some clear advantages to their use in your hospital for providing more accurate diagnoses and better patient care. If you are only performing two views, the left lateral and VD images should be taken. The right lateral view is commonly taken over the left lateral, but I believe the left lateral is generally more important than the right lateral view for both thoracic and abdominal radiographs. I will share my thoughts for why through the following examples. 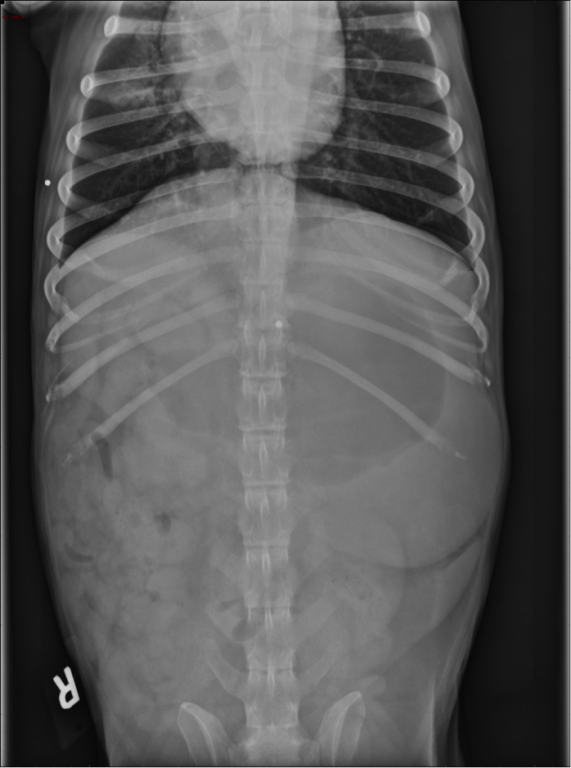 Figures 1-3 are three radiographs of an eight-year-old Labrador retriever dog presenting with a productive cough and suspected pneumonia. Figure 1. Right lateral thoracic radiograph: This image highlights the left (nondependent lungs) normal lungs. No pulmonary abnormalities are noted. Figure 2. 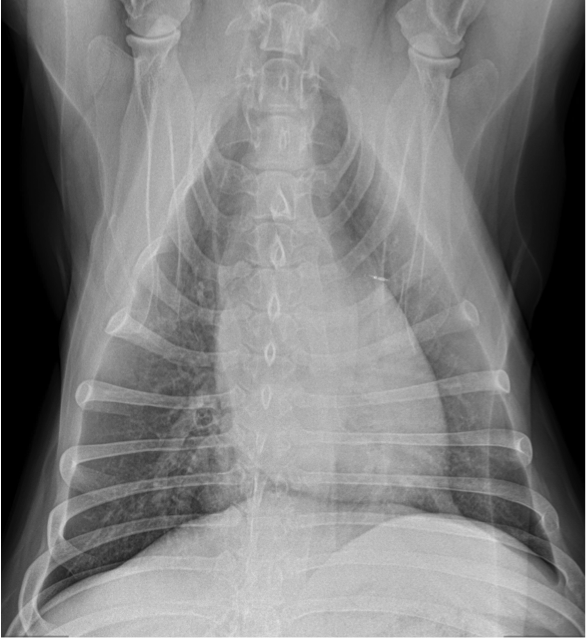 Ventrodorsal (VD) thoracic radiograph: No abnormalities are noted. Mild rotation of the patient to the left. Figure 3. 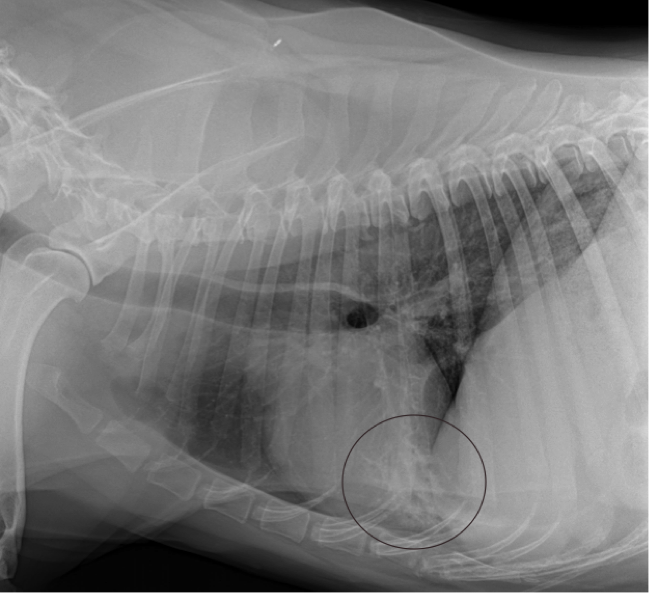 Left lateral thoracic radiograph: Note the mild alveolar pattern in the ventral aspect of the right middle lung lobe (black circle), consistent with mild pneumonia*. If only the right lateral (figure 1) and VD images (figure 2) had been taken on this patient, the diagnosis of pneumonia likely would have been missed because the right middle lung lobe changes are superimposed on midline on the VD view and within the dependent lungs on the right lateral view. The right lateral image highlights the left lungs and causes collapse (atelectasis) of the right lungs, obscuring the pulmonary changes. Often the images presented to me for interpretation on a consultation basis are rotated, similar to figure 2 above. Thus, if presented with only the two-view study, one of which is rotated, my ability to accurately confirm or rule out disease is reduced. *Anecdotally, the third view or left lateral view (figure 3) over right lateral thoracic view has proven to me to be more valuable, especially in cases such as this, or with asymmetrical or multifocal pulmonary pathology. One of the main reasons is because the most common location for pneumonia is in the right middle lung lobe, highlighting the importance of left lateral views. Also, asymmetrical or multifocal lung disease can have many different etiologies and that additional view has been very useful to me in differentiating between diseases including infectious/inflammatory, neoplastic processes and artifact. 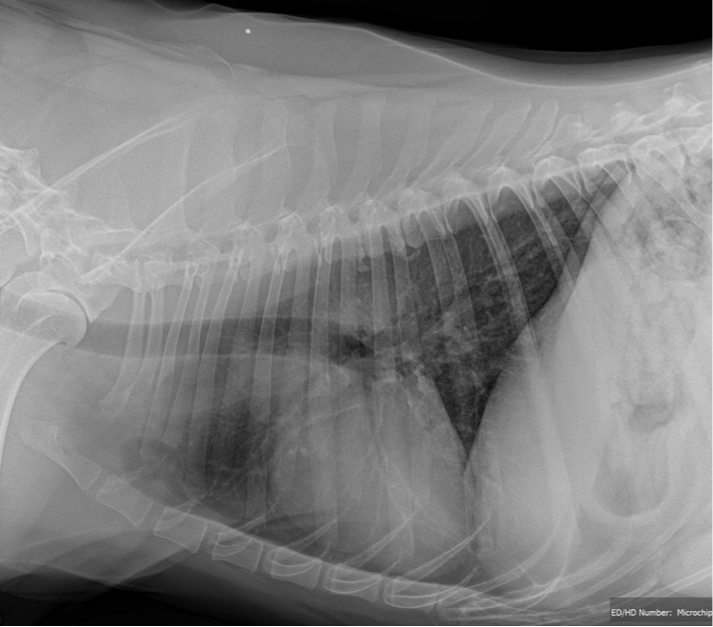 This next case (figures 4 – 6) is a 9-year-old mixed breed dog with vomiting and a mild cough. Figure 4. Right lateral abdominal radiograph. Figure 5. VD abdominal radiograph. 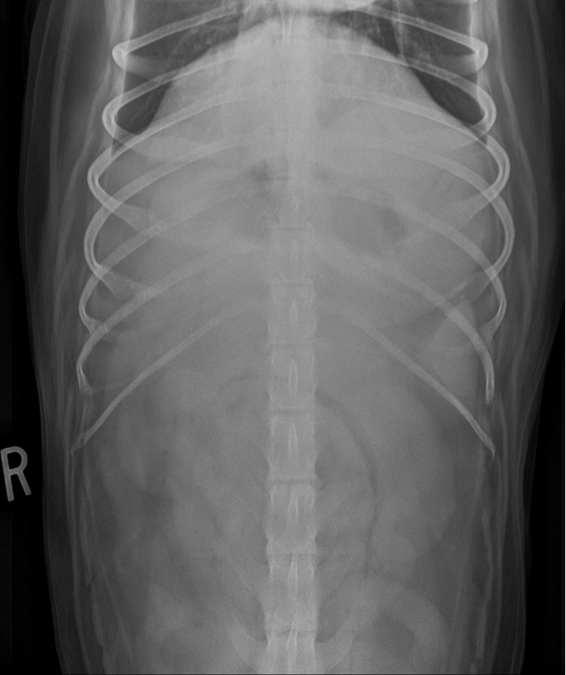 Please note in the right lateral and VD views, the stomach is dilated with mostly homogenous fluid and mild gas, causing right lateral and caudal displacement and/or bunching of the small intestines. This is suggestive of gastrointestinal ileus, however, both functional and mechanical etiologies are possible. There is also mild alveolar pattern in the right middle lung lobe on the VD image. Figure 6. Left lateral abdominal radiograph. There is a round, well-defined soft tissue opacity within the pylorus (black arrow), very suggestive of foreign material. There are also angular, comma-shaped gas opacities within the small intestine on this view. These findings are consistent with a linear small intestinal foreign body anchored in the pylorus. There is also mild alveolar pattern in the ventral aspect of the right middle lung lobe consistent with pneumonia, likely secondary to aspiration in this case. The left lateral image (figure 6) highlights the nondependent pylorus and duodenum and allows the gas to rise, filling the lumen, and enhancing visualization of its contents. Most of the time postprandial gastric ingesta will not remain in the nondependent pylorus on a left lateral image. Thus, the left lateral image can be helpful in confirming (or ruling out) both nonobstructive and obstructive foreign material. Additionally, if we focus on the original right lateral and VD images (figures 4 and 5) in this case, these were suggestive of obstruction. Without the benefit of the left lateral image, I would recommend abdominal ultrasound or upper GI contrast study to confirm diagnosis. Surgical exploration could also be considered, but would be clinician and client dependent, as I have seen situations such as this be a functional ileus with no obstruction. However, the left lateral image was available, and therefore we could confirm foreign material in the pylorus. Surgery was warranted and recommended. We were also able to confirm aspiration pneumonia in the right middle lung lobe, again highlighting the importance of left lateral images for thoracic and abdominal radiography. I have found the left lateral view to be critical in the evaluation of upper GI obstructions and especially small intestinal linear foreign bodies, because they are almost always anchored in the pylorus. Often the plication associated with small intestinal linear foreign bodies can be inconspicuous or equivocal, and the intestines can measure within normal limits for size. 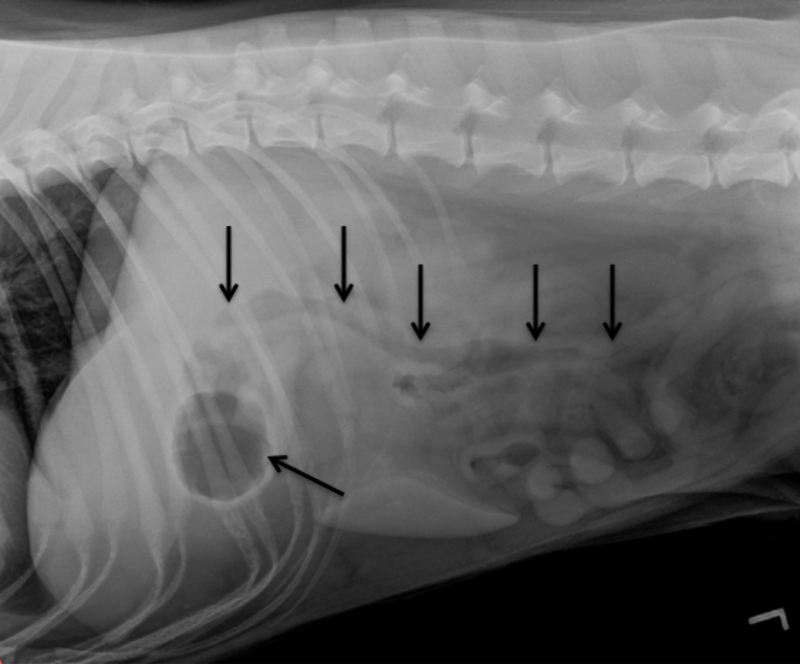 Therefore, simultaneously visualizing material in the pylorus (especially in an anorexic vomiting dog) is frequently adequate to recommend surgical exploration without additional imaging. This is not to say all soft tissue material in the pylorus in every patient is foreign material, however, these findings should alert the clinician (especially in patients with GI signs) of a need for further investigation. 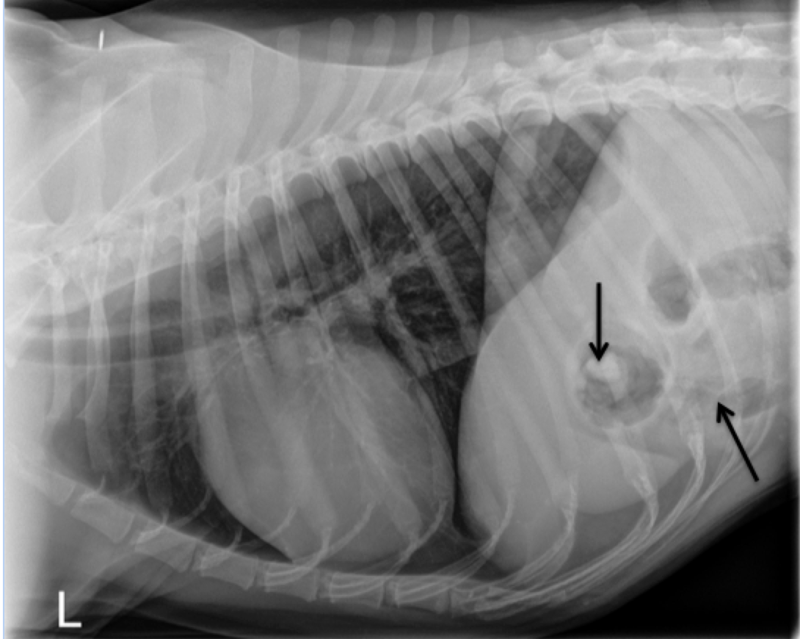 Figure 7 is a left lateral thoracic radiograph in a 5-year old mixed breed dog with a history of anorexia and regurgitation that was symptomatic for more than two months. Figure 7. Left lateral thoracic radiograph. The rounded soft tissue material in the pylorus, likely extending into the duodenum, alerted the clinician to evaluate the abdomen. On ultrasound, a linear foreign body was identified, extending from the pylorus to the mid jejunum with marked plication and an intussusception. Figures 8-10 show a three-view study of a young dog presenting with a history of vomiting. Figure 8. VD abdominal radiograph. Figure 9. Right Lateral Abdominal view. 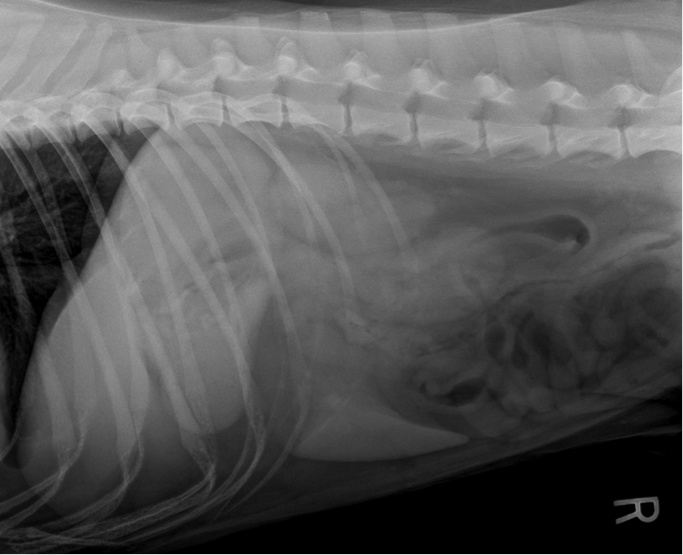 Please note in the right lateral and VD images, there is mild distension of the stomach. However, there is superimposition of the pylorus and proximal duodenum with the stomach and colon obscuring assessment. Figure 10. On this left lateral abdominal image, there is fairly even distribution of gas throughout the pylorus and duodenum with no evidence of foreign material or obstruction. For this patient, the left lateral allowed me to confidently rule out pyloric foreign material and upper GI obstruction. If only the right lateral and VD images were available this patient may have required more imaging or in-hospital time. As in this case and many others, gastric and colonic material can mimic gastric or duodenal foreign material. I strongly believe the left lateral view (or three-view study) enables a more complete assessment of the stomach and upper GI, allowing more definitive radiographic diagnoses and increasing confidence of obstructive and nonobstructive cases. The intent in sharing these stories is not to say a three-view or left lateral radiograph is required for every patient. Similarly, one should not infer a left lateral radiograph is always preferred over right lateral radiograph. 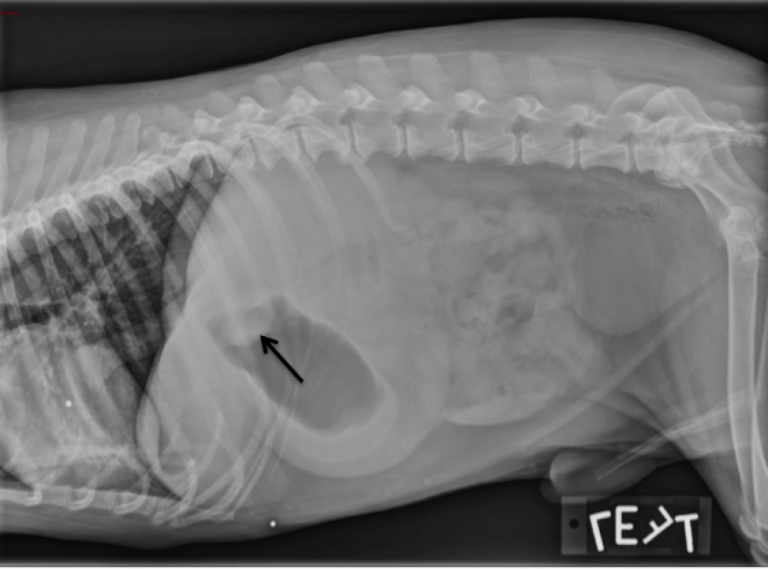 Case in point, a right lateral remains the most informative view in patients with suspected gastric dilatation and volvulus, and a single lateral may be enough to evaluate for urinary bladder stones. However, whenever possible, three-view radiographic study is preferred and if only two images are taken, obtaining the VD and left lateral images is the favored approach. In doing so, our patients will likely receive a more accurate and less equivocal radiographic diagnosis. Your medical team may also benefit from not having to perform additional images later, improving hospital efficiency while facilitating a better clinical outcome.